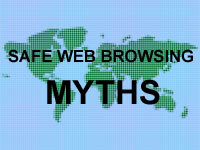 There are a vast number of myths and misconceptions about safe web browsing circling around. How many have you fallen for? Let's take a look at the top five myths. Myth #1: My computer has never been infected with malware so I must be a safe surfer. Nearly a third of all computers in the U.S. are infected with some form of malware. You may not even know you're infected. Web malware is designed to steal personal information and passwords or use your machine for distributing spam, malware or inappropriate content without you knowing it. Myth #2: Only gambling and illegal websites are dangerous. Not true. The majority of infected websites are ones that you trust. Hackers prefer to hijack and infect popular, high-traffic websites so they can silently distribute malware to unsuspecting visitors. Your computer can be infected just by visiting an infected site. Anyone who surfs the Internet is at risk. Myth #3: You can only get infected if you download files. False. Hackers take advantage of vulnerabilities in web browsers, plug-ins and operating systems. You can be infected with malware by simply visiting an infected website. An attack of this type is called a "drive-by" download because the malicious code is downloaded and executed automatically. Myth #4: When the lock icon appears in the browser, it means it's a secure website. Not true. The lock icon means there is an SSL encrypted connection between your browser and the web server which enables private communications over the Internet. SSL encryption doesn't provide any protection from malware. In fact, hackers often spoof SSL certificates on fake banking websites to make visitors feel secure. Myth #5: Only computers and laptops can become infected. False. Mobile malware, which affects smartphones, tablets and other mobile devices, increased by 58% last year. This nasty malware can easily steal information on your device such as phone numbers and email addresses. It can even use the device's GPS to track your whereabouts. Now that we've busted the top five safe web browsing myths, you're probably wondering how you can protect yourself. In today's world, security awareness education is not just a good idea, it's a necessity. Security awareness training can help you become aware of the threats so you can spot a risky site and know what to do when you land on one. Fortunately, MySecurityAwareness.com offers a wide variety of security tips and expert advice on information security.